Whenever I bake anything that calls for pumpkin I think of Thanksgiving and Christmas. 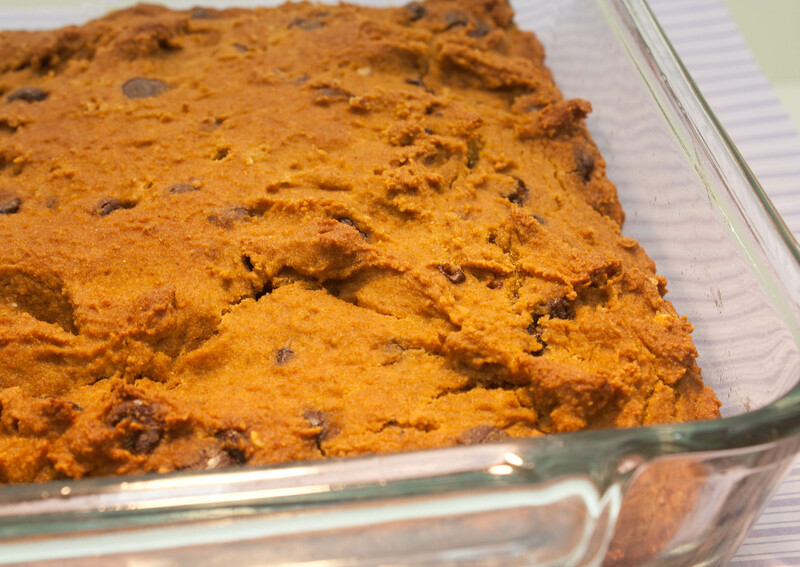 I do a lot of baking around that time of year and I usually default to pumpkin because I love it so much. Over the weekend my house smelled like Thanksgiving–full of Moroccan cinnamon, nutmeg and pumpkin. I loved it! Slice the pumpkin (or other squash, butternut squash is the sweetest, in my opinion) in half (from stem to bottom), take out the seeds (and make toasted seeds). Roast the pumpkin for about 1 hour (at 350 degrees F), face down, in some water that covers the bottom of the dish. You can also steam the pumpkin. Alternatively, you can dry roast it by wrapping it in foil and placing it in the oven. That would also reduce the moisture in the puree. 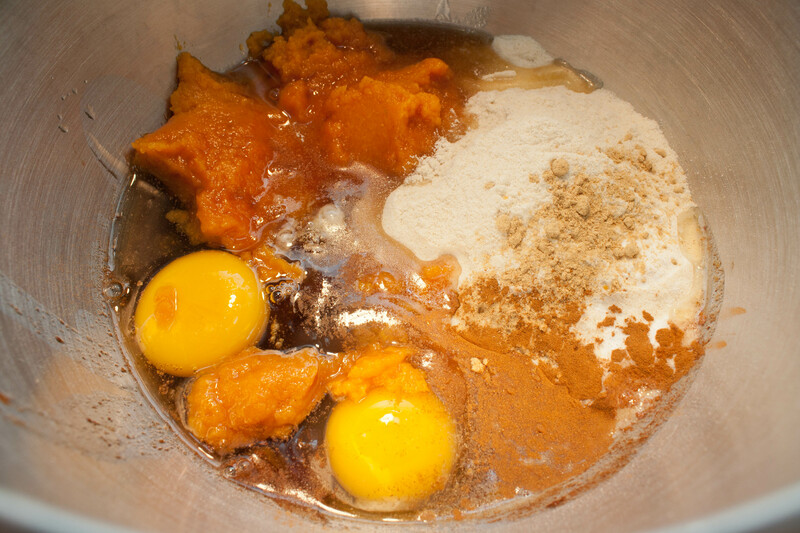 Cool the pumpkin, peel the skin off, and puree it in a blender or food processor. 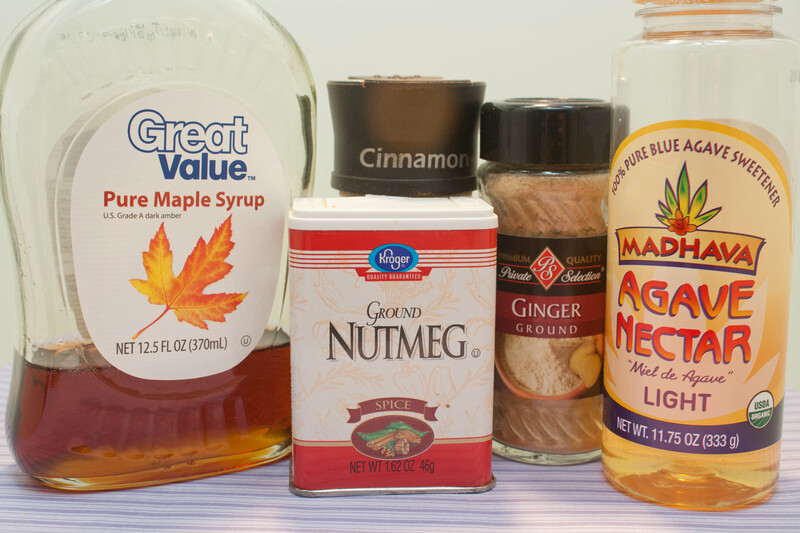 Combine all the dry ingredients in a bowl, blend well, and then add the wet ingredients and blend well. Bake in a bread pan (I used a Pyrex glass dish, 5 inches x 9 inches) for 45 minutes or until the outside is brown. When it’s done, a toothpick inserted in the middle will come out clean. Despite my last terrible failure with gluten-free baking (it was so bad I didn’t even share the recipe on the blog), I decided to give it another try. 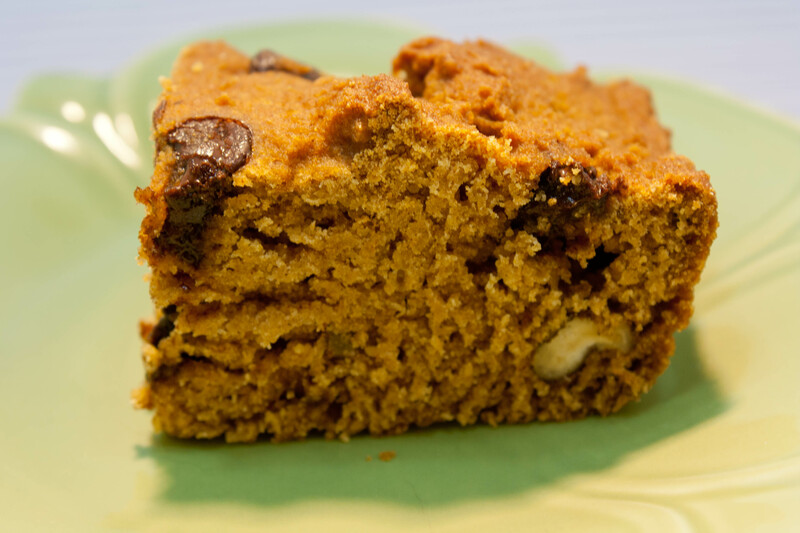 It took me a long time to find a gluten-free recipe for pumpkin bread that didn’t have a bunch of odd ingredients. The recipe called for almond flour but I had brown rice flour. I’m still not sure if all the gluten-free flours are interchangeable but it seemed to work…I used 1/4 cup of maple syrup and 1/4 of a cup of Agave Nectar. I also didn’t have cloves so I used nutmeg. Who knows if that was an okay substitute but it tasted great! It was a little dry but not so dry that it was awful or anything. The flavor was good, the texture was ok…I’m still not used to the way gluten-free things taste. 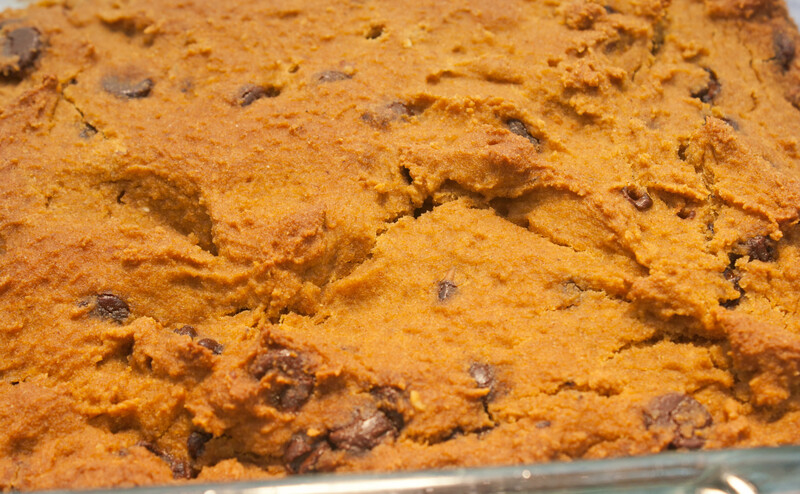 The consistency in this was pretty close to regular pumpkin bread, just not light and fluffy. It was denser. You can see some of the chocolate chips and a few pieces of the pecans. It was a really good addition. Honestly, I think the bread would be a bit boring had I not added some “fun” things. 🙂 A few days later when we had a piece it was a little dry but I heated it up in the microwave and that did the trick. Michael also tried it with cream cheese slathered on it and said that was awesome. For dessert I had a piece of the pumpkin bread and a scoop of butter pecan ice cream. It went well with the ice cream! You know you want a piece! So even though I want to try making the bread recipe again with applesauce to see if it makes it moister, I think this recipe is a keeper in my gluten-free recipe rotation! QUESTION: How do I moisten up this bread? I’m not going to pretend to be an expert, but based on the ingredients listed you may have overlooked oil or shortening. That may have made them more moist, maybe not. You could be right. Maybe adding a little oil will do the trick. 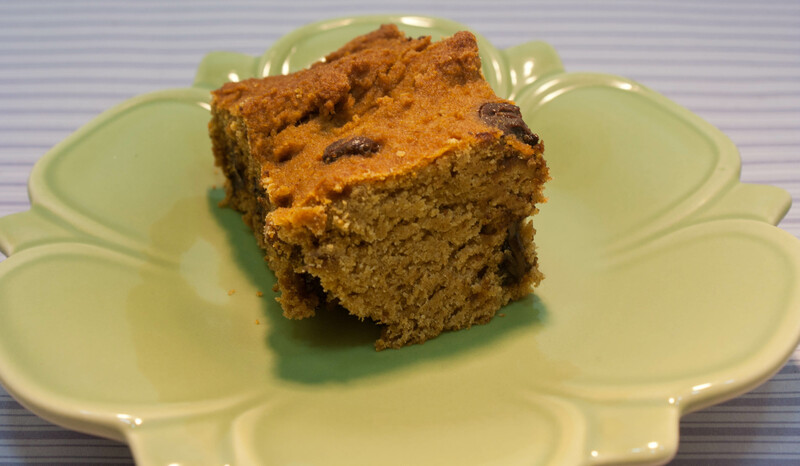 I add applesauce to my baked breads – that seems to help keep them moist. Looks delish too – and I agree, the “fun” things kick it up a notch! I don’t have any problems with gluten but pumpkin bread? Oh, behave! I have to make this, which means I have to ask someone to make it for me but this looks really good. Pumpkin is one of my favorite flavors and I like that this doesn’t go easy on the spices. The only problem and it’s not really a problem is that this is the quintessential fall dessert. With everything blooming I have too much cognitive dissonance. Oh well and I agree, I think applesauce would moisten it up pretty well. I think it needs fat. Almond flour is almost all fat, so that helps keep it moist. Rice flours are very dry flours and generally are used in a blend with others to help give lift. 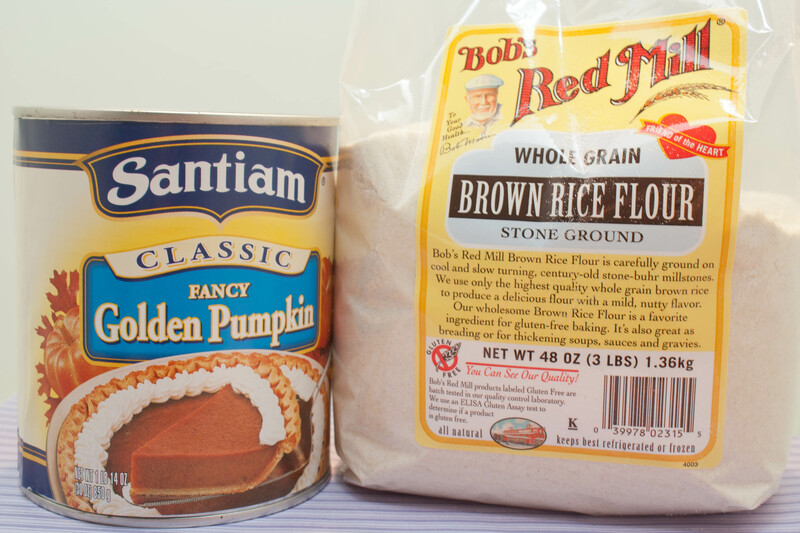 GF flours are not really interchangeable with each other. Here is a conversion chart that you can look at. You probably could just go with a GF flour blend like Pamela’s or Bob’s Red Mill and use that in place of wheat flour. They have the ratio of the different flours all done for you. Thank you for the explanation on the GF flours!! I will probably go to Trader Joe’s or Bob’s this weekend. I love anything pumpkin! And that actually sounds pretty damn good to me. I’d add the applesauce and raisins. And I’d stick with the almond flour. Or maybe a mixture if the 100% almond loaf was too dense. Thanks for sharing the recipe. I’ll keep it in mind next time I’m avoiding gluten. p.s. Does your man know how damn lucky he is that his woman is so willing to bake for him? And to roast the pumpkin herself no less? That’s love. To be fair, I used canned pumpkin. 🙂 But I have roasted it before. That looks so yummy! I agree with the above comments, applesauce might help moisten it up. 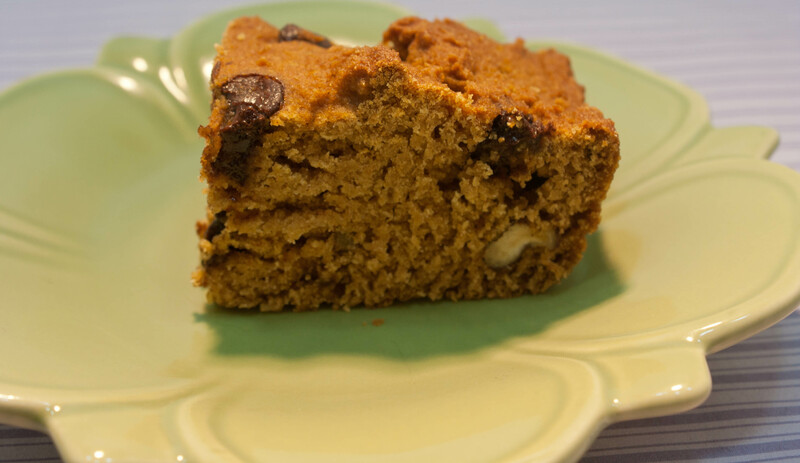 I love to bake so this is a must try recipe! I’m convinced! Applesauce seems like a great addition. How much would you add? Totally going to try this out!!! Miz recently posted..Im a 2013 Disney Social Media Mom! Another vote for applesauce here! I have a recipe for applesauce muffins that the family loves, loves, loves. Diane, fit to the finish recently posted..What is Your Take on the Dove Beauty Sketches Video? YUM applesauce muffins sound divine.